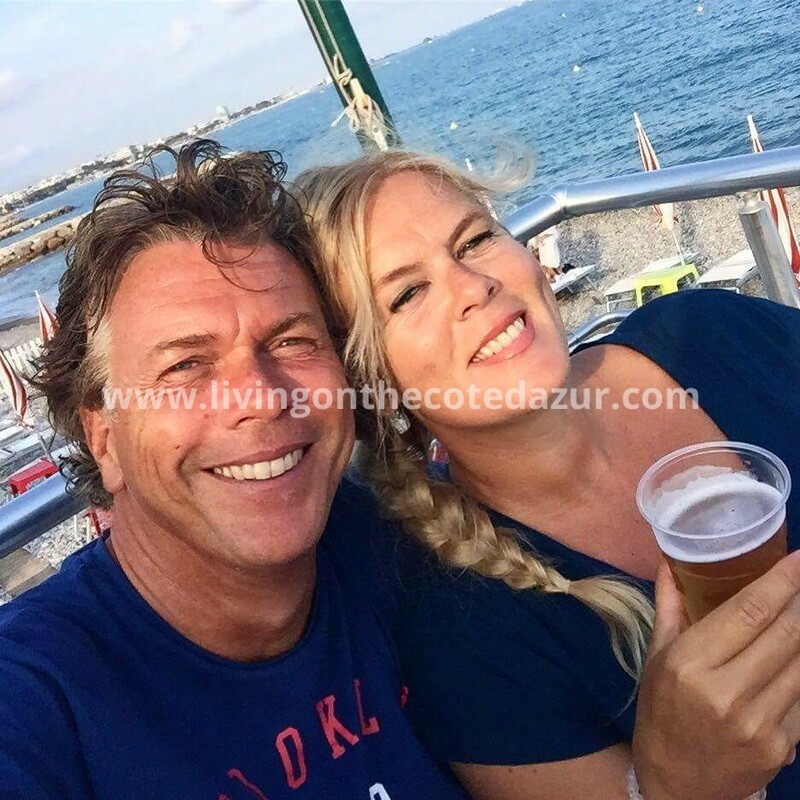 Anyone that visits the Côte d’Azur, will go to Nice. 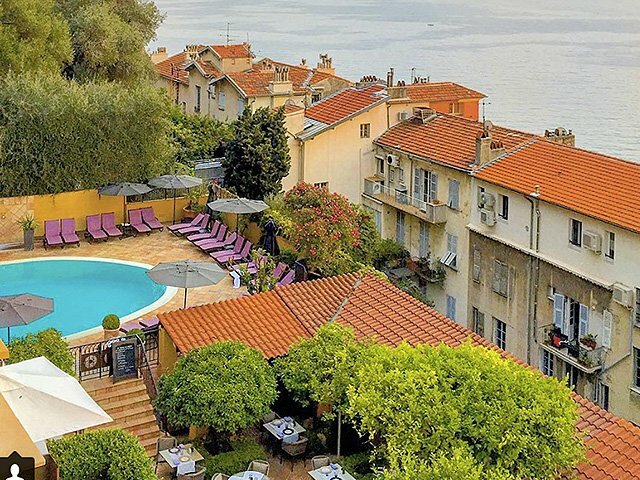 This bustling Southern French Riviera city is the metropolis at the Mediterranean Sea, full of creativity and culture. In the center you will find lovely terraces, old churches, medieval squares and restaurants full of people who just like ‘love life’. And of course, good food. 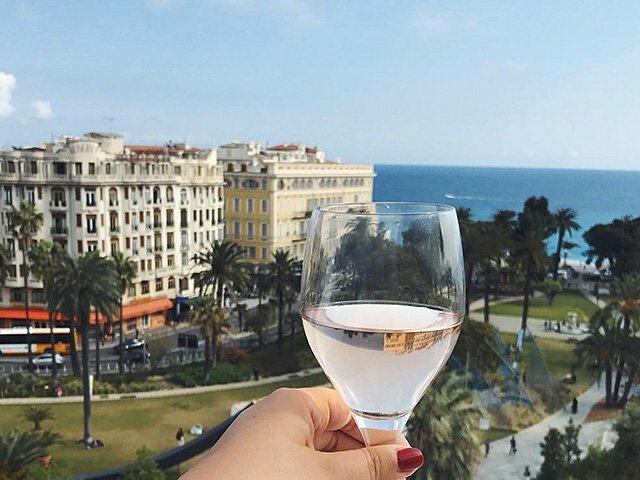 The ultimate way to see Nice from another side is from a roof top terrace. 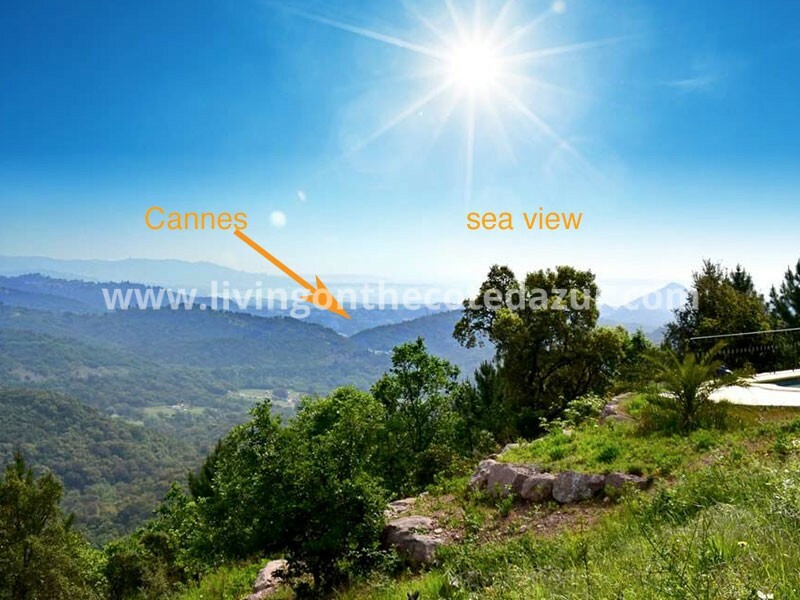 From the highest point you enjoy great views over the city, the mountains and the sea. Great spots for lunch, dinner and sometimes swimming too. Or take an Apéro (the local after work drink) at the end of the afternoon ; a delicious wine, a cold beer or a Pastis accompanied by some snacks. Be prepared to slide from dusk to evening, when the lights of the city start to shimmer. 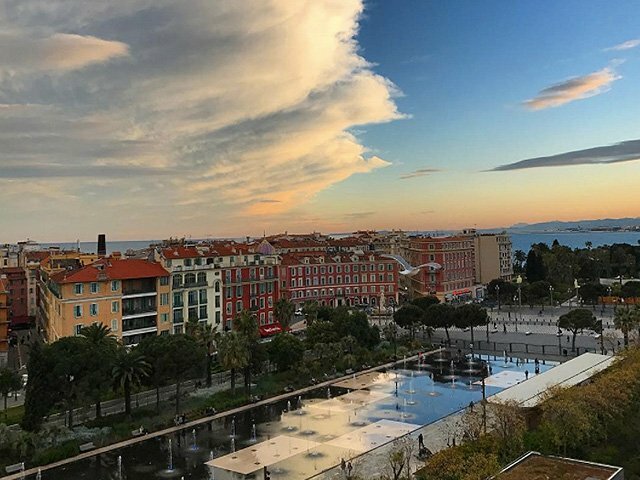 Views of the old town and the sea a; the top floor of hotel Boscolo Plaza has been the place to be in Nice for years. The St. Francis church on the left, the water mirror of the Promenade Paillon below you and unexpected views of the Esterel mountain with sea views! After the renovation on the top floor, the roof terrace with the lovely Aqua Bar of Aston La Scala is available again this summer. 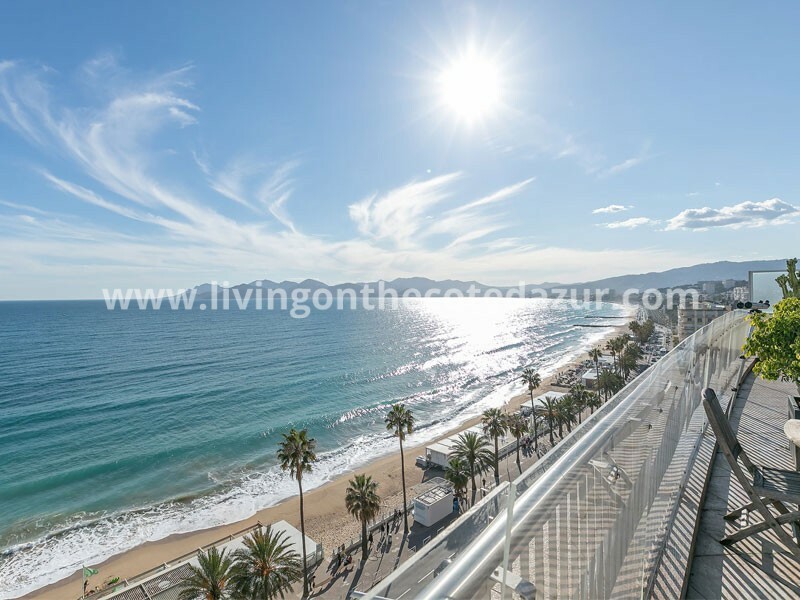 The rooftop terrace is on top of Le Meridien hotel, but after a few drinks in the sun, you really think you are on the beach. 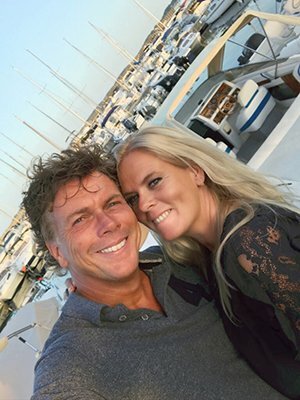 Or at least on board a cruise ship, so close to the sea. 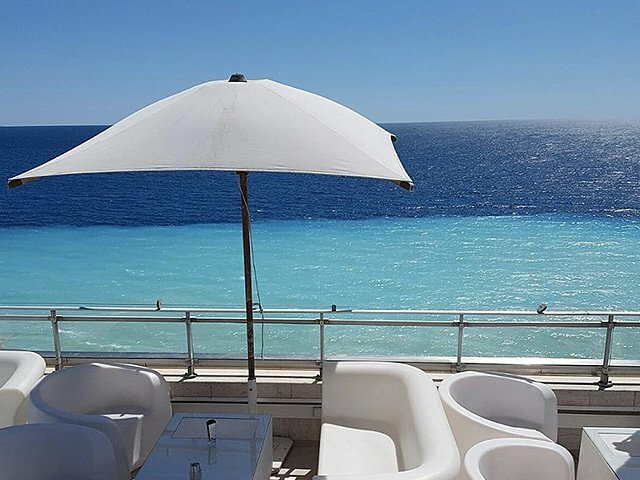 On the west side of Nice, on the rooftop terrace of the Radisson Blu Hotel, the Promenade des Anglais dominates the view. Enjoy a sun lounger by the pool or on a lounge chair on the 700m2 terrace and let the beautiful panoramic view take you away. Hi Hotel has been the trendsetter in Nice for years. Urban lifestyle, organic food and always the newest design. On the roof of the Spity hotel you can join in on the latest fashion trends. With a cocktail lounge, there is always a party on this rooftop terrace in St. Philip’s district. 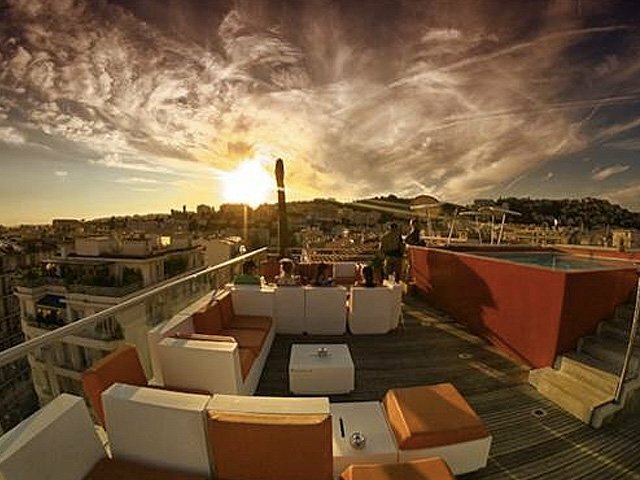 Rooftop 360 AC Hotel Nice, offers every Thursday evening a swinging Afterwork party until October. 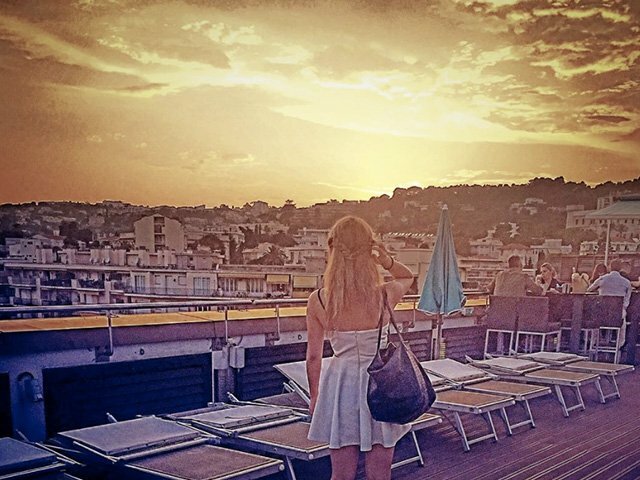 Rooftop 17 is located in the heart of the Libération district above Hotel Monsigny, and famous for its extensive brunch and theme parties. Discover the summer agenda on the site and book a place on the roof! 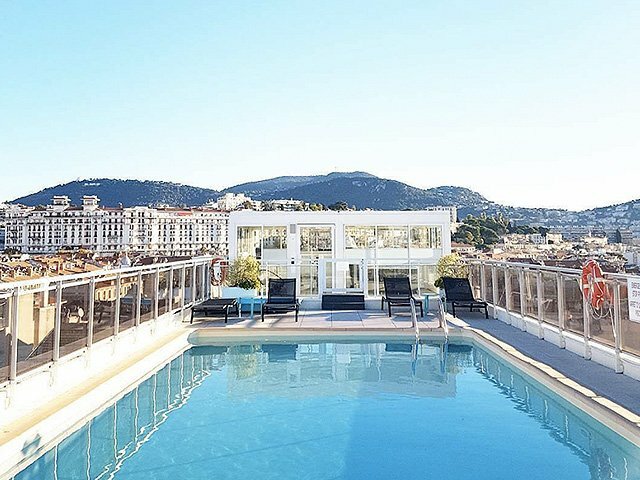 In the center of town, Le Splendid on the 7th floor combines an exclusive menu of the l’Essenciel restaurant while overlooking the rooftops of Nice. The hotel manager, Michel Tschann, was the first hotelier in Nice with a roof terrace in 1964. 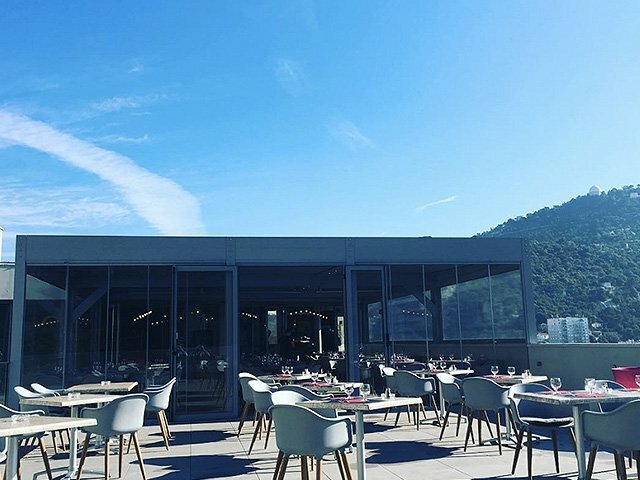 Du Patio is a beautiful terrace in an unexpected place; close to the old castle of Nice on of the most beautiful locations, within walking distance of the Saleya market. 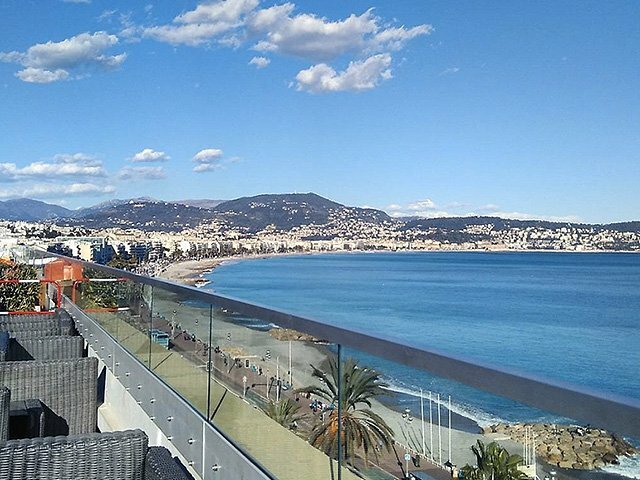 On the east side of Nice you do not expect a roof terrace but on the roof of Brasserie Le 65 you can literally enjoy endless views. From the view and the menu. No costs or effort was spared for this terrace where people are standing in line. 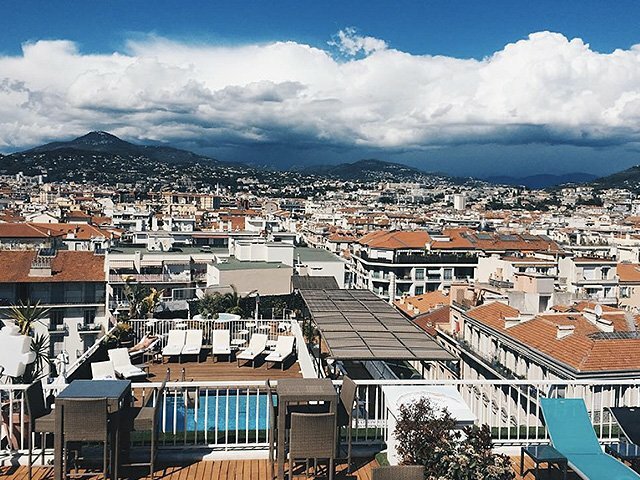 Book in advance for the latest roof terrace in Nice. 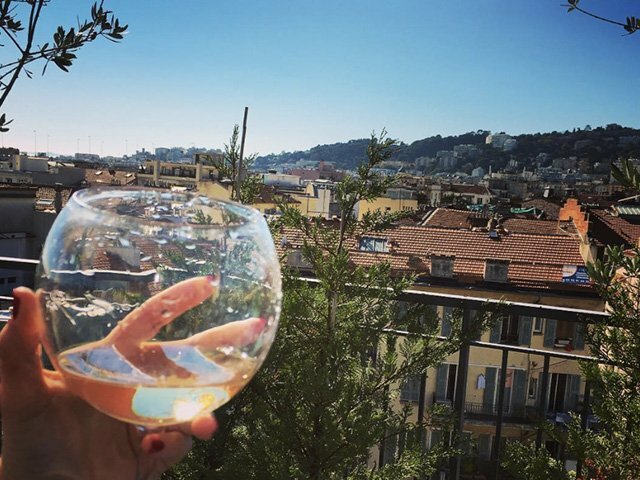 Cocktails, DJs, Jacuzzi and 360 ° views over Nissa la Bella. 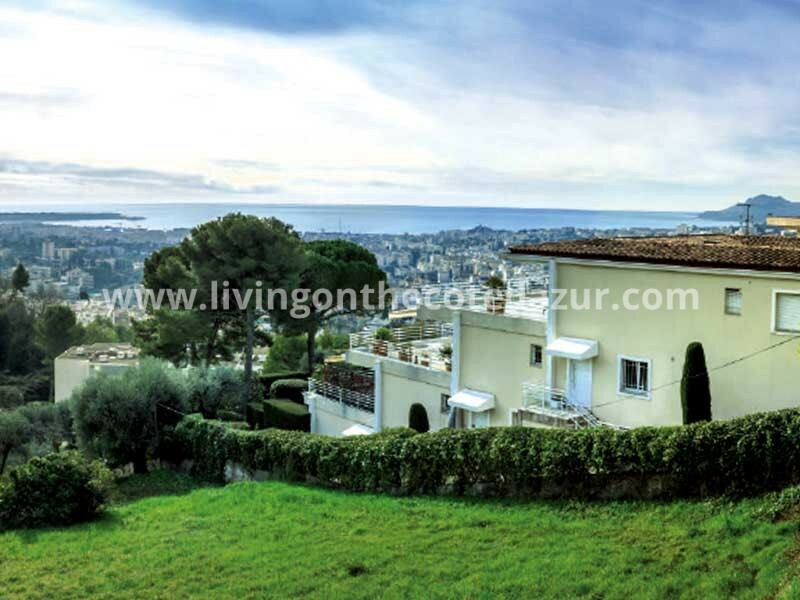 Looking to buy a second home in Nice? 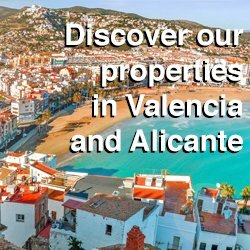 If you love Nice just as much as we do, check out our offers in new development apartments and luxury penthouses here. Dining tip: Restaurant Farinelli in Nice. The prosecco is waiting!